In Part 1 of my Renting vs. Buying a Home series I talked about the questions you should ask yourself before buying a home. Mortgage rates have been low and apartment rent prices seem to keep climbing. So is it finally time for you to buy a house? Creating a pros and cons list can help you get a clear picture of the path you should take. Even if you have the financing to buy a home, doing so at this time may not be right for you. Home ownership is a long-term, committed financial obligation and isn't always the best course for everyone. Ability to say, "I own this property" is incredibly satisfying! Can remodel, paint, and remake the house to your heart's content. Security in knowing you will likely call that place "home" for a long time. Can take advantage of tax deductions for loan interest, points, and various taxes. Monthly payments will remain the same with a fixed interest rate mortgage. Financially responsible for entire amount of loan. Financially responsible for property taxes, homeowner's insurance, and private mortgage insurance (if applicable). Both financially and physically responsible for all repairs and upkeep. Committed to living in one place until the home can be sold for or above the original purchase price. Committed to any less-than-desirable neighbors unless one of you decides to move. Susceptible to property value fluctuations, affecting whether or not you would lose money if you needed to sell and move. Can easily move to a different neighborhood or state if the location turns into something undesirable. Not responsible for any additional housing costs beyond that of rent and utilities. Not responsible for any routine repairs or upkeep. Committed only till the end of the lease or until you are able to sublet. Monthly payment builds equity for your landlord and not yourself. Rent price may increase at the end of a lease. Limited to implement your own personal touches with paint colors, fixtures, remodels, etc. There is no guarantee that you can renew the lease at the end of your term. Buying a home is a huge commitment that shouldn't be rushed into. I have friends who went into foreclosure because they purchased a renovation home that they really couldn't afford. Making a pros and cons list would have helped them see that while they could pay for the mortgage, they weren't able to afford the necessary upkeep and repairs as well. Sadly, when something had to give it was their monthly payment. Don't let this happen to you! Make a sound decision by weighing all of the good and the bad that can come from owning a home. Do you rent or own your home? What pros and cons are on your list? Check out Renting vs. Buying a Home - Part 1 here. It's the million dollar question among our family and friends. My husband and I have been sharing a home since 2012 and we still rent. People want to know, "WHEN ARE YOU FINALLY GOING TO BUY A HOUSE?" But they're asking the wrong question! They should be asking, "Why haven't you bought a house?" 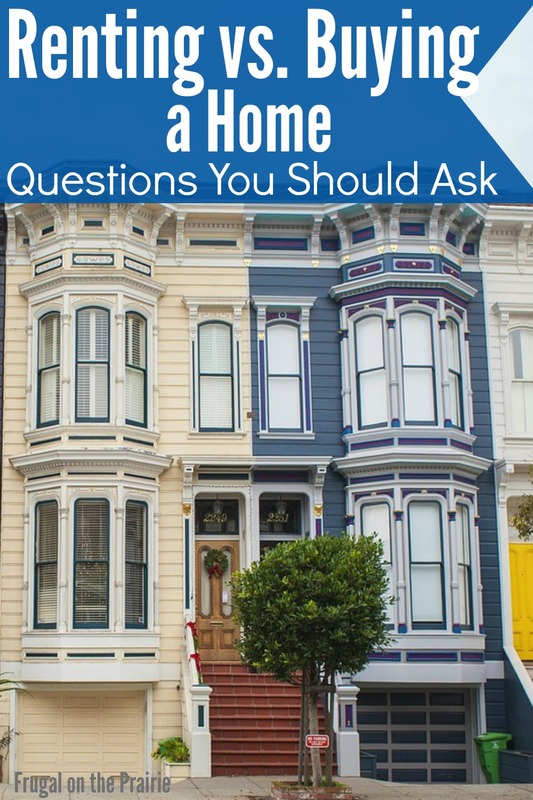 I'll tell you why we haven't, when we will, and the questions you should ask yourself before you purchase a home. How long will you live in your current city? Will you be living in the same city for at least 5 years? Home values will naturally depreciate and appreciate over time. You only want to invest when you are certain you'll be there long enough to outlive a fluctuation that reaches or exceeds your purchase price. Say you purchase a home for $150,000 but find out two years later that you need to move for your job. My husband's company offers a guaranteed home sale program, which means they'll buy our home if we move again with the company. This sounds fantastic but they'll only purchase the house for it's current market value. If we move while the property is experiencing a depreciated value, say $145,000, then we're losing money. This is the main reason why we won't buy a home right now. We moved across the country less than two years ago and still aren't 100% sure we'll be here for at least 3 more. Until we do, we will continue renting. What kind of down payment can you provide? To put down 20% or to not put down 20%? There are so many pros and cons that I could write about this for days. Some people insist that you should only buy a home with a 20% down payment in order to avoid private mortgage insurance (PMI). But how soon can you accumulate $40,000 for a $200k home? Is the time it would take to save that much money worth avoiding the extra cost? The idea that you have to pay PMI for an entire 30 year mortgage isn't entirely accurate. By law, lenders are required to terminate your private mortgage insurance when your scheduled balance reaches 78% of the purchase value of the home. While this is a more favorable scenario, it is ultimately up to you to decide whether or not the wait is worth avoiding the additional PMI cost. Can you afford the right school district? The best school districts are a huge factor if you plan to or already have children, which in our case we do. Our son hasn't even had his first birthday and I've already been told I will have to line up at 5am outside the best preschools for their first-come-first-serve enrollment. That's insane! But yes, we will probably do it because education is that important. Sometimes you can afford to buy a home in the right school district and sometimes you can only afford to rent there. But renting sometimes comes with such an unnecessary stigma. Trust me, I have heard it all! You're making the best financial decision for your family and there is nothing shameful about that. Rent now, buy later, and enjoy the best schools for your children in the meantime. Can you afford all the housing costs? We looked at homes for a short period before we realized we might be moving again. At the time we were approved for a loan that was much more than we were actually willing to spend. The monthly payment would have been nearly 50% (yes, FIFTY PERCENT!) of our take home pay. And that was just for the mortgage! The general rule is that your entire housing costs should not exceed 25-30% of your gross monthly income. This INCLUDES the mortgage, home owners insurance, taxes, and private mortgage insurance (PMI). Personally, we feel more comfortable hovering in the 20-25% area but that's because we contribute to multiple retirement accounts AND are building a college fund for baby boy. Buying a home is one of the largest financial responsibilities you will invest in. Do some thorough research on how long you think you'll be in the area and what kind of neighborhood/school district you'd like to live in. You don't want to regret buying your home later on! Crunch your numbers, do the math, and then add everything up 10 more times. If you've decided a home is still the right choice for you, then Happy Househunting! Do you rent or own a home? What other questions did you ask yourself before you made your decision? 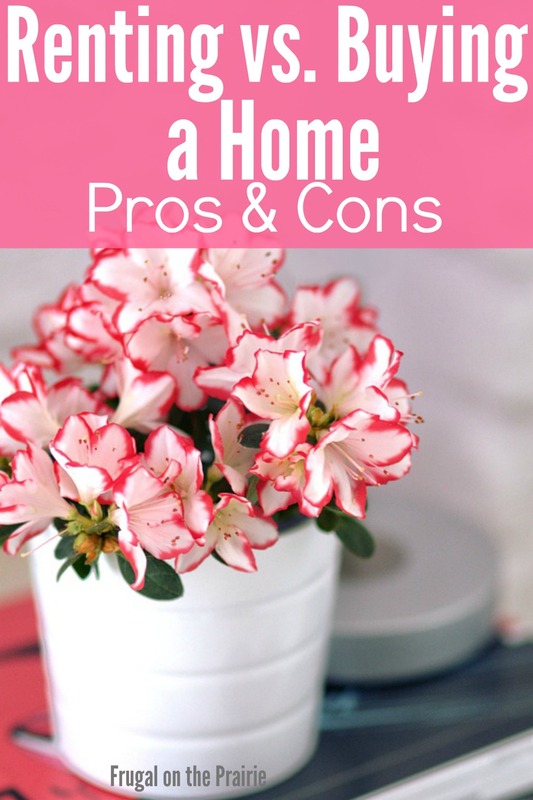 Check out Part 2 in this series, Pros & Cons of Renting or Buying a Home here!